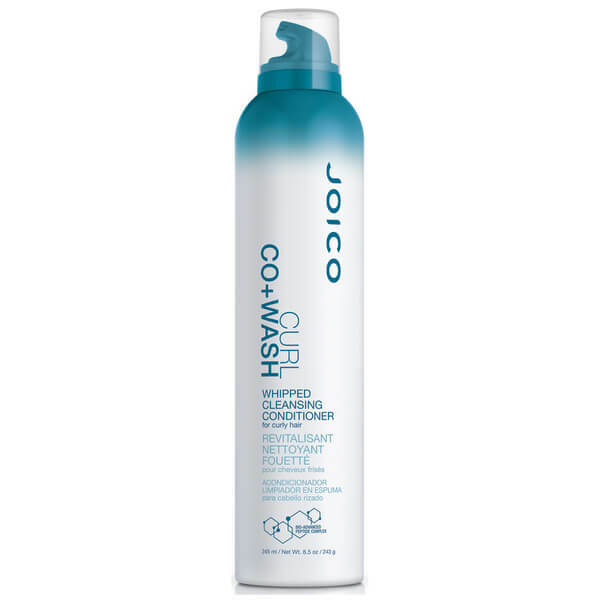 Catering specifically for curly, wavy or textured hair, Joico's Curl Co+Wash Whipped Cleansing Conditioner delivers the benefits of a gentle shampoo and revitalising treatment in one. Fortified with the brand's innovative AquaLastik™ technology, the creamy foam combines crystal-clear resins and deep sea minerals to protect against humidity and heat styling damage, effectively controlling frizz to reveal well-defined curls and waves. An antioxidant-rich blend of Babassu, Avocado and Camelina Oils work to restore stronger, bouncier and healthier-looking curls, whilst moisturising and detangling for perfectly polished, tamed tresses with enhanced shine. Its unique dispensing system delivers the perfect amount of aerated cream every time. Water/Aqua/Eau, Cetearyl Alcohol, Decyl Glucoside, Hydroxypropyl Starch Phosphate, Isobutane, Behentrimonium Chloride, Ceteareth-20, Orbignya Oleifera Seed Oil, Persea Gratissima (Avocado) Oil, Camelina Sativa Seed Oil, Cocodimonium Hydroxypropyl Hydrolyzed Keratin, Hydrolyzed Keratin, Pentapeptide-30 Cysteinamide, Pentapeptide-29 Cysteinamide, Tetrapeptide-29 Argininamide, Tetrapeptide-28 Argininamide, Bis-Diisopropanolamino-PG-Propyl Dimethicone/Bis-Isobutyl PEG-14 Copolymer, Amodimethicone, Citric Acid, Tetrasodium EDTA, Trideceth-12, Cetrimonium Chloride, Polysorbate 20, Butyloctanol, Benzophenone-4, Thermus Thermophillus Ferment, Polyquaternium-69, Glycerin, Magnesium Nitrate, Methylchloroisothiazolinone, Magnesium Chloride, Methylisothiazolinone, Isopropyl Alcohol, DMDM Hydantoin, Limonene, Linalool, Butylphenyl Methylpropional, Fragrance/Parfum.